Fundraiser by Paula Kane : Vlad has a rare disease and needs help! Vlad has a rare disease and needs help! This little cat is Vlad. He has been living a hard life in the woods for 3 years as a feral cat. Vlad has been placed under the care of a rescue - “Animal Lifeline Inc” of NJ. Vlad has a rare disease called “feline multiple epulides”. 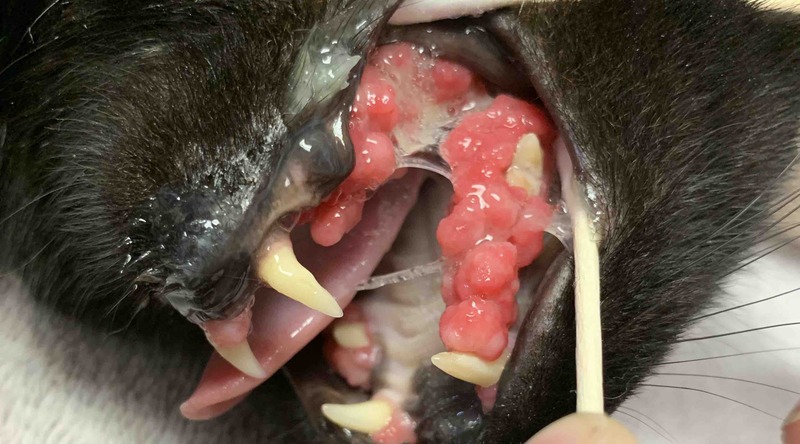 This disease causes benign tumors to grow in his mouth, and these tumors are growing so large that they affect his ability to eat, are pushing his teeth out of alignment, and cause his tongue to protrude from his mouth. Vlad needs a veterinary dental specialist to surgically remove the tumors and the “root” of these tumors from deep in the tooth socket, so that the tumors do not return. The total cost of the procedure is estimated to be 3000 dollars. Vlad has recently become friendly to his me (his foster mom) and has been brought indoors to live a comfortable life. He is 3 years old, FIV/FeLV negative, and healthy. Vlad finally has a chance to have a good life - warm, safe, well fed, and free from mouth pain. He has asked us for help. Please help us give it to him. Thanks to all of you who have donated we were able to schedule Vlad’s surgery! Vlad is having surgery tomorrow at U of Penn to remove his teeth and the tumors. The surgeon feels that this will cure Vlad! Keep little Vlad in your thoughts tomorrow and I’ll update here as soon as he’s done.